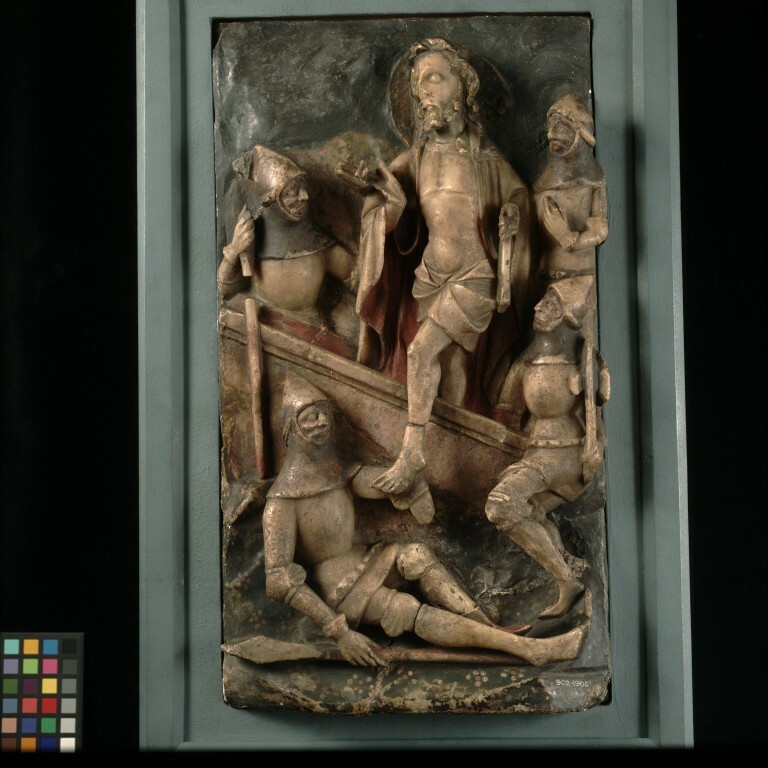 This alabaster relief representing the Resurrection is made in England in the 15th century. Christ is represented haloed and bearded, wearing the torse and loincloth and the shroud over his shoulders, blessing with his right hand and holding the cross-staff of the Resurrection in his left. Unusually, he steps from the tomb with his left foot, his body slightly turned to the left of the panel. There are no other recorded English alabaster panels of the Resurrection with Christ represented stepping from the tomb with his left leg. There are two sorts of alabaster. Calcite alabaster is very hard and was used in ancient times. And gypsum alabaster which is a fine-grained, soft and smooth stone. Although at first glance it looks a little like marble, which it was intended to imitate, it was much easier to carve due to its softness, and alabaster objects were therefore significantly cheaper to produce. The haloed and bearded Christ, wearing the torse and loincloth and the shroud over his shoulders, is represented blessing with his right hand and holding the cross-staff of the Resurrection in his left. Unusually, he steps from the tomb with his left foot, his body slightly turned to the left of the panel. He treads on the left arm of a soldier, who wears a pointed basinet and a tippet of mail, a low-belted jupon, gauntlets and armour on his arms and legs. He lies across the front of the panel, leaning against a raised piece of ground, and holds in his right hand a spear which lies on the ground beside him. Three similar soldiers, who apparently are awake and gazing at Christ, are represented on the panel. One kneels on the right of the tomb, holding a battle-axe in his left hand, a second standing behind him. A third soldier is behind the tomb on the left of the panel, holding in his right hand a spear or battle-axe which rests on the ground in front of the tomb. There are many breaks in the panel with much filling in with plaster. The top corners of the panel and a small piece on the lower right side are restorations. Most of Christ's cross-staff and parts of the soldiers' battle-axes are missing. The left arm of the recumbent soldier has been broken off and his left leg is restored in plaster. The left leg of the soldier in the bottom right of the panel is restored in plaster. While traces of the original paint appear to survive, especially the usual daisy pattern on a green ground at the bottom of the panel, much of the carving has been overpainted, evidently to conceal the damage and repairs. The panel has been completely backed with plaster. Given by J.H. Fitzhenry in 1905. Historical significance: There are no other recorded English alabaster panels of the Resurrection with Christ represented stepping from the tomb with his left leg. Panel, alabaster in relief painted and gilded, depicting the Resurrection, English, 15th century. Nelson, P. Some Unpublished English Medieval Alabaster Carvings. Archaeological Journal. LXXXII, 1925. p. 34, pl. IX, 2.